► South Carolina (Richland County), Columbia — 40-4 — "Chesnut Cottage"
► South Carolina (Richland County), Columbia — 40-3 — "Commissioners' Oak"
► South Carolina (Richland County), Columbia — "The Spirit of the American Doughboy"
► South Carolina (Richland County), Columbia — Cecil Herbert Land D.D. ► South Carolina (Richland County), Columbia — Diamond Hill — The home of Lt. General Wade Hampton, C.S.A. 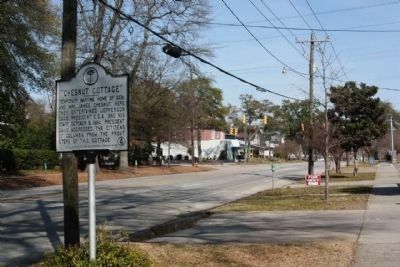 Camden and Cheraw will "in effect become suburbs of this city... through the construction of the new Seaboard Rail Line. The State May 10, 1900.